Home » About Us » Anuj S. Puppala M.D. 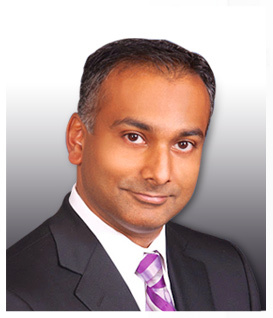 Dr. Anuj Puppala, a board-certified orthopaedic surgeon, specializes in joint replacement surgery of the hip, knee, and shoulder, as well as arthroscopic surgery and fracture surgery. Additionally, Dr. Puppala performs minimally invasive direct anterior hip replacements, which are less painful and have shorter recovery times. Upon graduation from Northwestern University, Dr. Puppala attended medical school at the Chicago Medical School and then went on to complete an internship and residency at Ochsner Clinic Hospital in New Orleans, Louisiana. During his time at Ochsner Clinic Hospital, Dr. Puppala served as associate team physician for the New Orleans Saints and the New Orleans Hornets sports teams. Dr. Puppala previously spent time as associate team physician for University of St. Francis in Joliet and currently serves as team physician for Romeoville High School in Romeoville, Illinois. Dr. Puppala combines leading edge, minimally invasive techniques with proven traditional methods to provide patients with the best possible care.